Risotto is such a lovely thing. I just had the best risotto of my life on a recent work trip to Portland at a restaurant called Metrovino. This stuff was insanely good. It was a mushroom risotto with shitake and oyster mushrooms and truffled mascarpone. We had it as a shared appetizer, which was perfect, because I think it would have been way too rich as a main course. I don’t know what they put in it, but it was out of this world. I probably don’t want to know. Restaurants sneak in so much unhealthy stuff. Risotto with Corn, Roasted Peppers, and Pepper Jack Cheese is relatively light in comparison to the heavenly mushroom concoction I had in Portland. There is no butter, cream, or mascarpone cheese. I have been making this recipe for years and it is one of my favorites. It is a little spicy from the pepper jack cheese and the hot sauce, slightly sweet from the corn, and balanced out by the fresh green onions. Risotto can be a little daunting. It is all about the liquid/stirring method. I have no idea if I am preparing my risotto in the correct way. No doubt, risotto purists would have something to say to me when I get distracted in my kitchen and forget to stir the rice, or add more than the appropriate amount of liquid. Oh well! All I know is that I am always pleased with the result. The Perfect Pairing for this risotto recipe (or any risotto recipe) is a ladle. You have to add a small amount of liquid to the rice in intervals and then stir it until it is almost completely absorbed, and then repeat the process until the rice is cooked and creamy. The simple ladle is the perfect tool since it is usually about ½ cup measure. Rest the bell pepper on a cookie sheet lined with foil; place the cookie sheet under the broiler. Be sure to watch it closely! Turn the pepper until all sides are blackened. Remove the pepper from the oven and place in a bowl. Cover the bowl with a plate so that the pepper can steam. Once it has cooled you can easily peel off the blackened skin and remove the stem and seeds. Chop into bit sized pieces and set aside until ready to use. In a large saucepan bring the water and broth to a slight simmer, keep warm over low heat. In a large skillet heat the olive oil, add the rice, cumin, coriander, and garlic. Sauté for 2-4 minutes, stirring often. Using a ladle, add approximately ½ cup of the broth to the rice. Stir constantly until the liquid has almost completely absorbed into the rice. Add remaining broth in ½ cup intervals, stirring very often, until each portion of liquid is absorbed before adding the next. Taste the rice for doneness; you may need to add more water if it is not completely cooked. 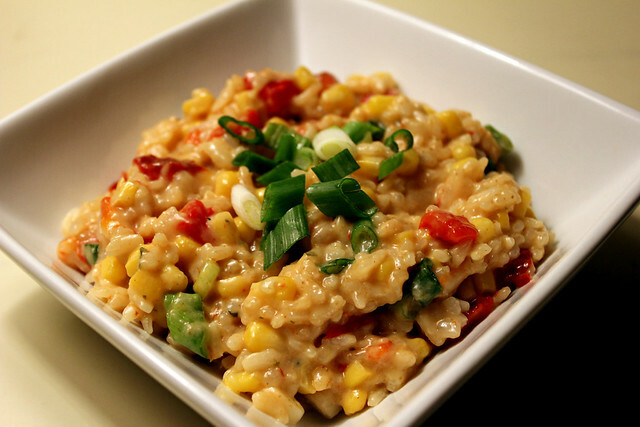 Remove the rice from the heat and stir in the chopped roasted pepper, green onions, grated cheese, hot sauce, and corn. I have never made risotto from scratch mainly because Trader Joes has a great frozen asaparagus risotto so I take the easy way out. I will definitely try this recipe! Thank you! I hope you like it! It is definitely one of my favorites. What can you serve with this dish? I struggled with this as well! I usually serve it with pork tenderloin, grilled chicken, or pork chops. Anything with BBQ sauce would pair nicely. Even a simply marinated flank steak, cut into strips, and grilled would be great. I hope this helps!